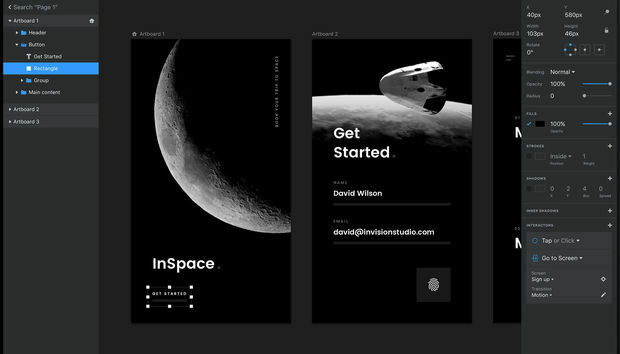 A brand-new digital design and UX application has been announced by the website and app prototyping developer InVision. As Adobe XD has grown from a digital design tool to include prototyping and client feedback tools, Adobe has pushed into territory occupied by the likes of InVision. Now InVision is pushing back - launching a desktop design application called Studio that's a rival to Photoshop, Illustrator, Sketch or whatever tool you use to design apps, sites and other digital products. Studio's available for Mac and Windows, and includes both design and prototyping features. You can design elements and layouts, and add interactivity and animation using quick and simple tools. You can see InVision Studio in action in the video here. InVision's CEO Clark Valberg says that Studio's big benefit is that it works seamlessly with the rest of InVision. "We started as a cloud-based collaborative extension to Photoshop," he says, "as Photoshop was all we had. We were a complement to those desktop design tools, but the missing piece for the customer was that those tools are still very focussed on graphic, aesthetic-oriented design. The craft of digital product design has many more dimensions: interactivity, animation, the fabric that ties the design team together - that's where Studio comes in." InVision sees the integration with its wider platform as a big differentiator between its platform and Adobe XD. Clark says that XD has relatively basic collaboration tools compared to InVision's, which the latter sees a making its platform more suitable for larger organisations such as its clients including Airbnb, Amazon, Nike and Uber. "Adobe is super-good at making desktop tools for individual participants in a creative process," says Clark. "InVision is an evolution of this, thinking about how those people work together." InVision is also attempting to beat Adobe on price, at least for current InVision customers. While the company hasn't announced pricing for Studio yet, Clark says that it will be 'incredibly competitively priced". "It's very difficult for designers to get orientated in a tab among a hundred others," he notes. "Also, even with modern web technologies, there's still a fidelity issue and a performance gap." Studio is currently in closed beta - which you can sign up for - but should ship in January 2018.